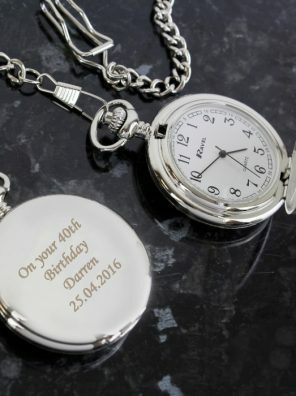 The front of the watch case can be personalised with any message over 4 lines and up to 15 characters per line. 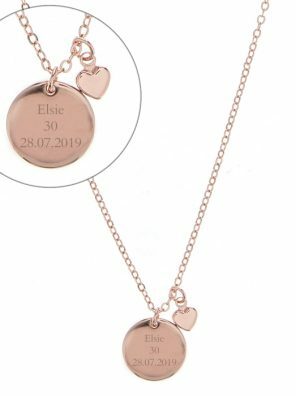 This Personalised Rose Gold Coloured Disc and Heart Charm Necklace is a stylish and elegant gift for her that is suited to all occasions. This rose gold coloured necklace can be personalised with 3 lines of text with up to 10 characters per line. All text is case sensitive and will appear as entered. 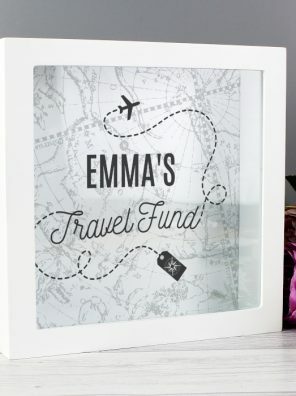 This Personalised Travel Fund Box is a stylish way to save for a special trip! This box can be personalised with a name up to 12 characters. The words ‘travel fund’ are fixed and cannot be amended. 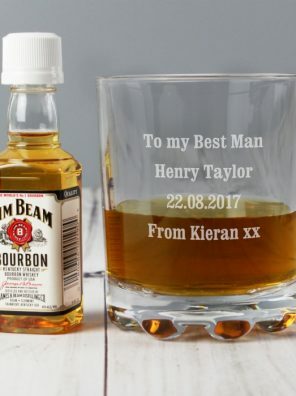 Treat a lucky recipient to their favourite tipple in their very own personalised tumbler! 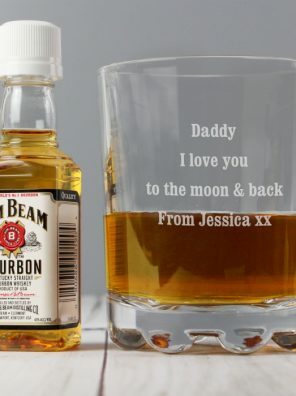 Personalise this Tumbler and Jim Beam Miniature Set with a message over 4 lines, with up to 20 characters per line. 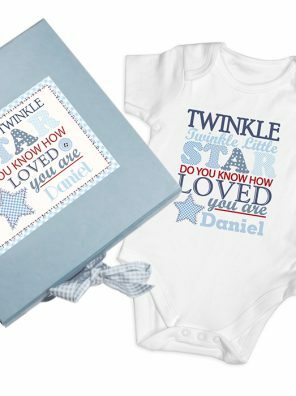 Personalise this Twinkle Boys Blue Gift Box & Baby Vest with any name up to 12 characters. 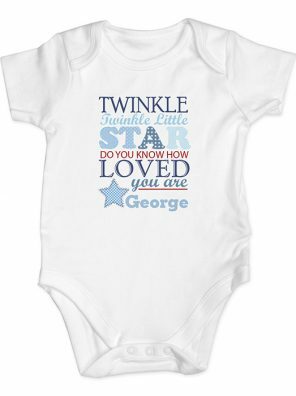 ‘Twinkle Twinkle little star do you know how loved you are’ is fixed text. The name will appear on the box and baby vest. Personalise this Twinkle Girls Pink Gift Box & Baby Vest with any name up to 12 characters. 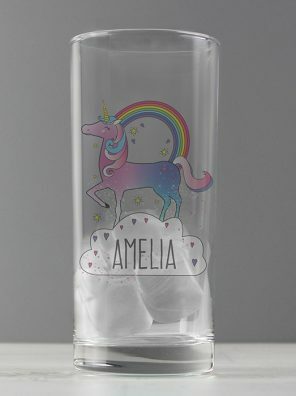 This stylish Unicorn Drinks Bottle will ensure that she’s the envy of all her friends! The bottle can be personalised with a name up to 12 characters long. Please note that the name entered will appear in upper case. The words ‘unicorn fund’ are fixed and cannot be amended. 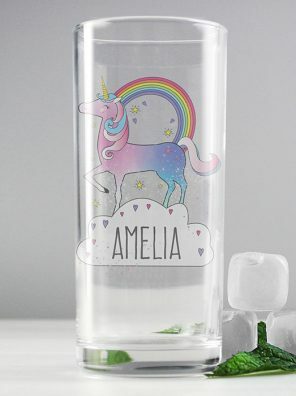 This Personalised Unicorn Milk Bottle is a fun way to help children get the calcium they need. This bottle can be personalised with any name up to 12 characters. Personalisation will appear is fixed uppercase. Add a touch of magic to any room with this Personalised Name Unicorn Snow Globe! This snow globe can be personalised with a name up to 12 characters.